There are many things that I find scary, including running out of money, peanut butter, and toilet paper. Valentine’s Day can also be frightening. But Jayla has personified an even bigger fear. That is one skary test, deserving of nine exclamation marks. I can hear the test’s maniacal laugh, made that much more sinister because it’s a lipstick-wearing test. Those are the worst kind. Thanks to Jayla’s mom, Veronica of Mama Bird Musings for sending this to us. Please visit her blog. Submit your child’s funny writing (or the writing of a random stranger who’s little) to us at StuffKidsWrite(at)gmail(dot)com. Chase will answer your email. Now it’s your turn. What do you find skary? 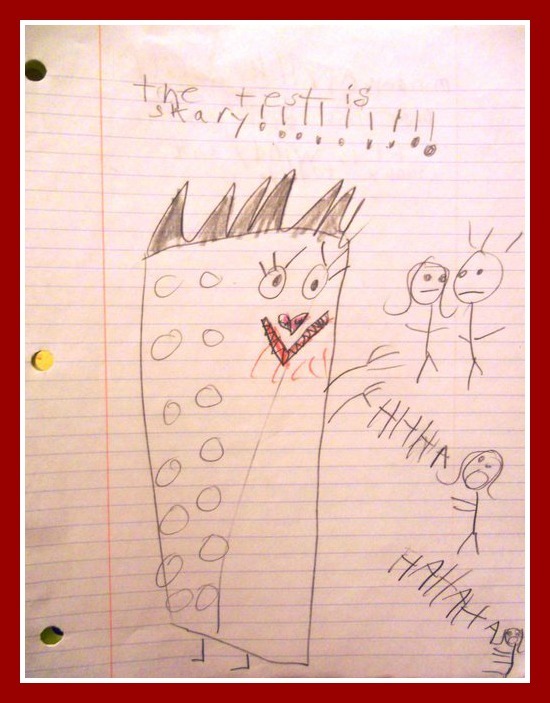 Posted on February 14, 2012, in Diaries and Journals and tagged Chase McFadden, funny kids writing, Leanne Shirtliffe, mama bird musings, scary test, Stuff Kids Write. Bookmark the permalink. 2 Comments. Yeah, tests are pretty skary. Have to agree with that one. I still dream about college exams! And that was many, many years ago. This is so funny! Lipstick tests are the skariest! … or it’s blood from the children?